Boy meets girl through a common friend and love blossoms. It was a typical bollywood chase before Amisha shouted out the 'Yes'. 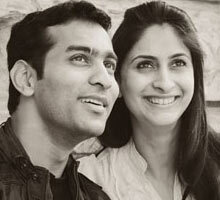 Though she lived in UK, Amisha always wanted to get married in India. So, Amisha and Premal chose Royal Rajasthan as their wedding venue. Boy meets girl through a common friend and love blossoms. In a typical Bollywood movie scenario, Amisha made Premal run behind her before she said 'Yes'. Though she has always lived in UK, Amisha always wanted to get married in India because of her maternal connection and what could be a better venue than Royal Rajasthan. Amisha and Premal scouted for venues around Jaipur and Udaipur and when they visited Devi Garh, Udaipur they fell in love with it. As Amisha says, "The property and its ambience had an air of tranquility about it. I wanted to get married at a place that had a sense of serenity and Devi Garh really had it." Says Amisha: "I am very happy we chose Devi Garh as the venue- their staff were excellent and went out of the way to make our celebration and stay memorable. They organised the entertainment, decoration and catering and each element exceeded all expectations" She adds: "Frozen Apple, www.frozenappleevents.com the Udaipur based event management agency managed the mandap and travel arrangements. Though I was based in London, and Sahil, the owner of Frozen Apple was in Udaipur, co-ordinating with him was always easy- it was fun working with him and his team." Amisha's Mehndi had the flavor of Gujarat. Marigolds formed the perfect backdrop to make the morning even sunnier. Says Amisha: "I always dreamt of sitting in a gaddi and getting my mehndi done with my girlfriends around me. In one of the jharokhas at Devi Garh, we actually created a seating area. I wore a hot pink anarkali by Rimple and Harpreet Narula and Premal wore a light blue kurta from a designer in Mumbai. After the Mehndi, we were lead into the courtyard where ladies of the family did garba." The theme of Sangeet was pink and white and the decor echoed it. Says Amisha, "A UK based photographer created a video of how we met. So the video played in the background in between live performances by all of us. There was a 'happy marriage' clothes line for guests to pen & hang their messages and best wishese. So by the end of the sangeet we had hundreds of chits hanging there with lots of warm messages." The Ganesh puja was held by the Presidential pool side so the reflection could be seen in the pool itself creating a beautiful aura about the whole ceremony. "The alcove was also decorated with marigolds that went pretty well with morning sun. After the puja was the haldi ceremony, after which my friends pushed me into the pool. It was a fun morning with the entire family." The wedding decor was all about elegance and royalty. Says Amisha: "The baraat came with all the fanfare with Premal on the elephant. The mandap was decorated with the cutout of a Mughal King on one side and his Queen on the other side. Red and blue were the prominent colors here. All the men in the family tied the safas. " For the wedding Amisha wore a stunning fully embroidered orange and white lehenga by Padma Jalan who runs a non-profit organization where the underprivileged girls learn warli techniques to make these lehengas. Says Amisha, "I am very happy that the money I spent on the lehenga helped a good cause." For the reception, they wanted a more Western theme. So they thought of a sit out dinner by the pool side where all guests could enjoy the evening. The 'just married' couple entered through a big flight of stairs as man and wife. Says Amisha, "After the cake cutting and champagne my father, the best man (Premal's cousin) and Premal gave speeches. To mark the happy beginnings we released around 300 Chinese lanterns. The bidaai was done on a camel cart. To add the Indo English touch, we placed at the back of the cart, a licensed plate with the message 'Happily Ever After."